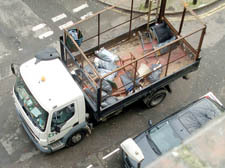 THE removal of valuable possessions from the homes of council tenants was branded “systematic theft from dead Camden residents” when a secret Town Hall report was finally disclosed on Tuesday following months of campaigning by councillors and the New Journal. A year after this newspaper’s investigation into the clearance of the Gospel Oak flat of dying Dorothy Robinson, 92, prompted allegations that her home had been “looted” by council clearance teams and re­vealed that nothing of value had been recovered from the 1,200 council houses similarly cleared every year, councillors called for “heads to roll”. The report by the council’s internal audit team revealed for the first time that items were routinely taken by members of the Building and Maintenance Division during clearances of properties that became “void” through the abandonment, death, eviction or relocation of tenants, and that this practice was authorised by managers. It included evidence that 60 staff may have been involved, and that managers obstructed the investigation of the council’s internal team. It went on to claim the New Journal probe into the abuses had “damaged” and “undermined” the council’s own clandestine investigation, an accusation supported by officers and social care chief Cllr Martin Davies. Other councillors attacked the claims. “This would never have seen the light had it not been published in the CNJ,” said Cllr Keith Sedgwick. Although two members of BMD staff face disciplinary charges, the evidence that the practice was widespread and condoned was described as “scandalous” by committee chairman Chris Philp, who forced the disclosure of the report after Town Hall lawyers repeatedly blocked its discussion since he first requested it in September last year. In a meeting where tension between the council’s staff and elected councillors frequently threatened to bubble over, assistant chief executive Philip Colligan acknowledged that the conduct of house clearances had been deeply flawed and that wide-ranging changes had been put in place. He added that discuss­ing the report in public was dangerous and unprecedented and could jeopardise ongoing disciplinary proceedings. The questioning promp­ted protest from several committee members and led the elected chiefs of both housing and adult social care to make highly unusual formal statements of confidence in the council’s highest managers.